Lock in a great price for ibis Styles Geneva Gare – rated 8.8 by recent guests! Location close to the central station and going to the airport is really easy. Room is very clean and it has a comfortable bed. We had various food for breakfast. Fresh breads, fruits, and juices are provided. 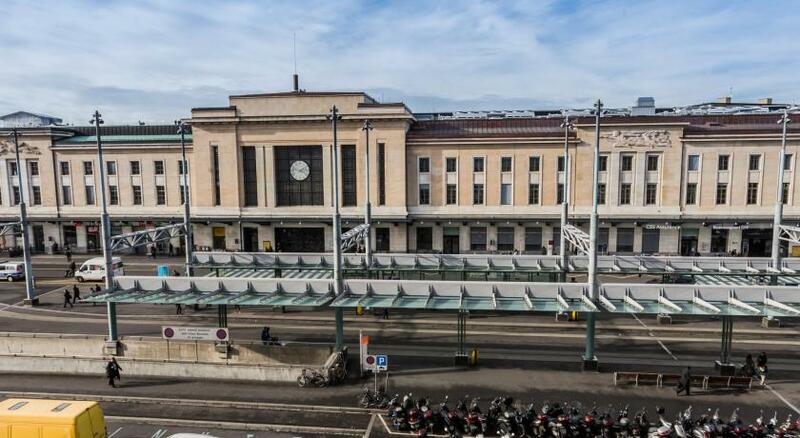 Located directly across from the Main Train Station, it's so easy to get to the airport and anywhere in Geneva, as the trams and buses all stop nearby. Very stylish lobby with free tea/coffee all day. Good water pressure and warm water. Comfortable sleep. The staff were helpful. Good breakfast. I would recommend this hotel, especially if travelling by train. Great location, all major sightseeing are at walking distance; also bus and tram stops in front of the hotel. Helpful staff. Underground public parking right to the hotel, very comfortable and the hotel gives a card for discount, which was substantial. Also the hotel provides daily cards for the public transport in the city. Breakfast is excellent even though lacks variety. Coffe and tea are free all the day. Wifi is good. Round the clock coffee vending Machine. Quality of breakfast was pretty good. It was available from as early as 6 AM. Close to train. Allowed me to drop a suitcase off a week early. Excellent location, clean, friendly staff and a very comfortable bed. Love that it was at walking distance to the lake and many other places. Walked to the old city and the shopping area with no problems. ibis Styles Geneva Gare This rating is a reflection of how the property compares to the industry standard when it comes to price, facilities and services available. It's based on a self-evaluation by the property. Use this rating to help choose your stay! Overlooking Place Cornavin and Chantepoulet Square, the ibis Styles Geneva Gare is centrally located across the Main Train Station of Geneva and the Cathedrale Notre Dame. A breakfast buffet is available every morning. Surrounded by the best shops, restaurants and lush parks, the property has excellent connections to all areas of the city and the airport, and it's close to the beautiful Lake Geneva. Unwind in stylish and elegant accommodations and have the multilingual hospitality service of the staff at the ibis Styles Geneva Gare. United Nations and other international agencies are about 10 minutes away. 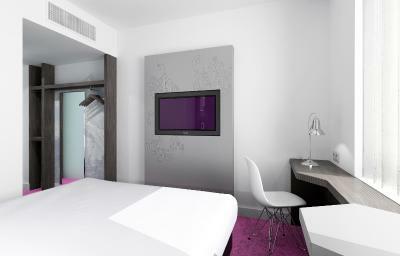 When would you like to stay at ibis Styles Geneva Gare? This double room has air conditioning and soundproofing. Public parking is available at a location nearby (reservation is not possible) and costs CHF 30 per day. These hotels come in a host of different styles and all feature simplicity, comfort, quality and conviviality. Each hotel has pop, pep and personality. For families or friends, solo or duet, business woman or business man, welcome! House Rules ibis Styles Geneva Gare takes special requests – add in the next step! ibis Styles Geneva Gare accepts these cards and reserves the right to temporarily hold an amount prior to arrival. Staff was coperative. If could be little flexible with early check in that will be helpful. The station is in front of the hotel. My second time spent at this hotel and the staff&breakfast remained the same- excellent. Location&comfort also the same! Friendly, helpful staff. Cozy rooms with comfortable beds. Good breakfast included with lots of selection. Good location close to the train station, bus station, and walking distance to all the sights. Location good, staff friendly, room clean. For the price they charge, we couldn't have expected any more. They offered unlimited access to a kitchen area which had a coffee machine, snacks, fruit, juice. Staff were extremely friendly and helpful. It was a very pleasant start to our visit to Switzerland.